In our family, we strive to live a calm life that is free of anxiety and unnecessary worry. But, I do like to be prepared. I do like to think ahead. I am capable of being spontaneous and adventurous, I just like to have my ‘just in case’ kit with us wherever we are headed. 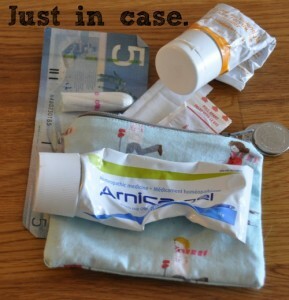 To be honest, I have two ‘just in case’ kits: one for when we travel by car, and one that I take with us no matter where, or how, we are traveling. They both serve a slightly different purpose, and obviously the ‘wherever we go’ packet is a little more compact than what we take with us when we travel by wheels. I am not the first woman in the world to come up with this little family safety idea, but I do try to go against the conventional flow and tend to load our ‘just in case’ kits with natural and organic material whenever possible. I try to avoid purchasing the prepacked kits, which are great, but tend to be pretty generic, and build my own kit from items around my house or that I can pick up at the local health food store. So here is an inventory of the items I take along with me in my ‘purse’ [read: cloth bag]. I keep all of it in a little pouch that I made from a couple of scraps and a zipper. If you aren’t into stitching, you could pick up a pouch like this in the toiletries isle of a drug store, or even a sturdy freezer ziploc bag! Simple stuff, I know. But, I can’t tell you the number of times this little pouch has come in handy! Now, the larger car-travel pack! I picked up a clear makeup bag for this one. Before we gave up our car, I kept this bag in the spare tire well. Now, I just throw it in the back of our rentals and remember to take it out before returning the car. These items make sense to me if we ended up with a flat tire or dead battery. It also makes sense to me to pack items that are useful if our son was carsick while driving. The Larabars are essential to a roadtripping gluten free vegan – not all rest stops are able to accommodate my dietary needs. I throw in the flashlight because I like to kid myself and think that if there was something wrong with the car I was driving I would be able to figure out the problem without calling a mechanic. These little family safety kits won’t be much help in an extreme crisis, but they are great to have around for road trips and day-to-day ‘outs and abouts’. 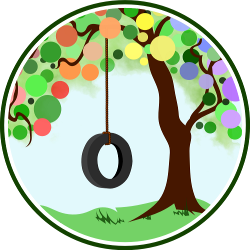 What do you pack when you go out with your kiddos? 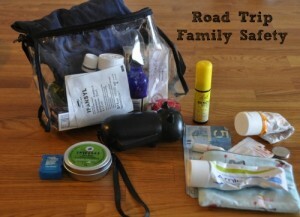 Do you take a just in case kit on road trips? Are your packs more extensive or just a band aid thrown in a backpack? Share your tips and tricks for keeping your family safe. Love this post Lyndsay! These are the kinds of things I’ve been meaning to get on the ball about forever – you’ve both inspired and given me the perfect plan for creating. Thank you! I need to get something like this together! I used to be better about keeping emergency supplies in the car, even down to a baggie with our cat’s food in case of emergency evacuation. But I haven’t been on the ball as much lately.